Felix Mendelssohn-Bartholdy. Song without Words. 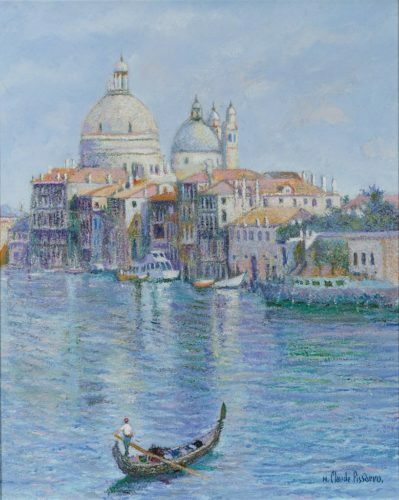 "Venetian Gondolier Song"
This essay was created as an experience of music analyses with the use of both terminological systems: English and Russian. «Venetian Gondolier Song» is one of the Songs Without Words from Notebook 2, op. 30, No. 6. The program subtitle of the work defines its main artistic and expressive features. First of all, the time signature of “Venetian Gondolier Song” is 6/8. Lyrical in character with traces of melancholy and a light dream it is typical for the barcarole genre. Against this background, a cantilena melody almost sings the extended phrases with deep breathing of a vocalist. The form of the work may be considered as a binary form with recapitulation, complete with an introduction and a coda. The key is f-sharp minor. The piece begins with an introduction of six measures: it does not contain a thematic material, but its characteristic accompaniment introduces the general mood of the barcarole, and it is maintained throughout most of the work. The first part is a one-tone repeated thematic structure, consisting of two phrases, with a brightly expressed exposition type of setting. The first phrase ends with a middle cadence, the second phrase ends with a perfect authentic cadence, which rounds out the first part. The melody, starting from the third stage, moves rather smoothly, with the jumps filling out the on-going counter-movement on one side and balanced in jumps in the opposite direction on the other. Each of the melodies, lasting for eight measures, has a close resemblances of a vocal line. The second part (from the 22nd measure) begins with the development of the isolated initial two-bar element of the main theme, to which the tertiary «second» is added: harmonized by the authentic turn (Dominant seventh – keynote), this element is sequenced, first in f-sharp minor, and then in A-major, the measure of sections is of two bars. The third section of the sequence is modified and continued ascending movement in the melodic f-sharp minor (measures 28-29). The loudness dynamics is increasing, from f to ff and sfz. The tension is gradually amplified, but suddenly the development in the melody is interrupted by the unstable dominant harmony, on the third on the VII raised scale tone in the fifth octave of the f-sharp minor (measure 30). In measures 31-32, only the accompaniment sounds (it is indicated in the scheme by the sign __ ). The melodic movement resumes only after almost two measures: after diminuendo in accompaniment, a trill sounds on c-sharp of the sixth octave in the melody on pp, leading to a climax on the tone of the e of the sixth octave sounding on sfz (measure 35). This is the higher tone in this composition. Thus, the approach to the climax in this work is «two-step», since it passes in two stages. The climax is abandoned by a downward conjunct movement that turns into a reprise. It begins at bar 36 and represents a reiteration of the second phrase of Part I, somewhat modified by re-harmonization in measures 37-38 and counterpointing the same sound c-sharp of the sixth octave in measures 39-40, reminiscent of the recent culmination. In whole, due to the described developing elements and general instability, in the second part, before the reprise, the median type of setting is clearly expressed, and this entire segment executes the developing function, and sequencing is an element of development. The recapitulation rounds the form and ends with a perfect authentic cadence. The type of setting in this section is exposition, as in the second phrase of the Part I. The coda goes through with a brightly expressed determination, which displays itself in the confirmation of the basic tonality in two ways. The first one is in the upper voices twice passes the Phrygian turn from I to V scale tone with return to the keynote through the trill on the VII raised scale tone. The Phrygian turn sounds in the accompaniment bass with a delay of half of bar, as in a free imitation. The second one is in the last five measures three times the intonation-rhythmic turn follows, depicting the tonic triad of f-sharp minor, the last time in rhythmic deceleration (ritardando). Music, as it were, «wastes away «, «dissolves». The total length of the final construction is 13 measures. The proportions of the second part are increased in comparison with the first one, mainly due to intensive development at the beginning of the second period and a rather long culmination. Besides, the length of conclusion exceeds the introduction by more than double. In connection with the use by the composer of the binary form with recapitulation, the thematic subordination of the parts is due to the presence of the material of one general theme in both parts, their homogenous texture as well as the absence of bright contrasting elements and the predominance of the tonality of f-sharp minor.